In Level 5, your budding musician will develop crucial skills in singing and vocal development, focused listening, playing instruments, and reading and composing music. Creative movement or dances are combined with music fundamentals for the perfect pressure-free preparation for piano, violin, or voice classes. Our first year of Level 5 introduces the glockenspiel, a pre-keyboard instrument. In Year 2, we learn the two-string dulcimer, a stringed instrument, and the recorder, a wind instrument. At the end of our two-year program, you’ll be fully equipped to decide which direction to take next in your musical journey – and we’ll be with you every step of the way. 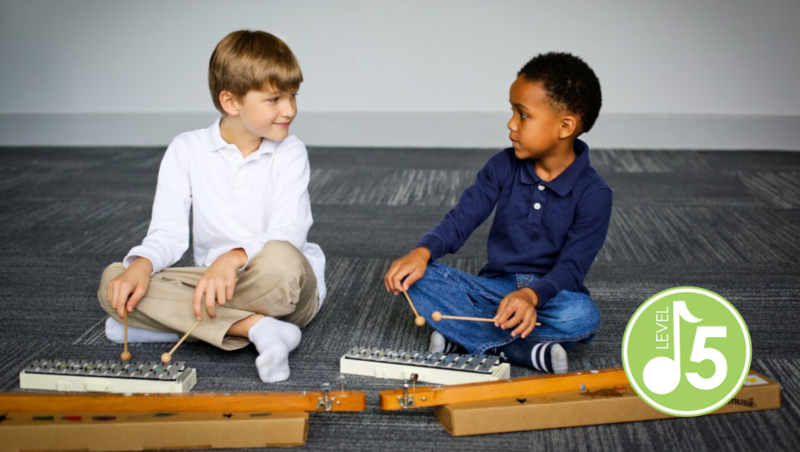 Through a variety of interactive, fun, and engaging activities, students explore many facets of the musical experience, including speaking, singing, moving, dancing, listening, creating and playing instruments as well as learning basic musical notation. Price is per child, per month and includes tuition. Fall materials fee of $70 will be charged August 1 (or at the time of enrollment, whichever is later). Spring materials fee of $50 will be charged January 1. Due to the progressive nature of this curriculum, we do not accept new enrollments after October 1. Satisfactory completion of Year 1 is a prerequisite of Year 2. Membership benefits include 60-minute weekly classes; home materials, including printed resources, CDs, and instruments; a birthday gift; fun holiday celebration classes in October, December, and February; and a Kindermusik Graduation and Family Fun Festival in May. Should you enroll your 4- to 5-year-old in Level 4 or Level 5? Info coming soon!